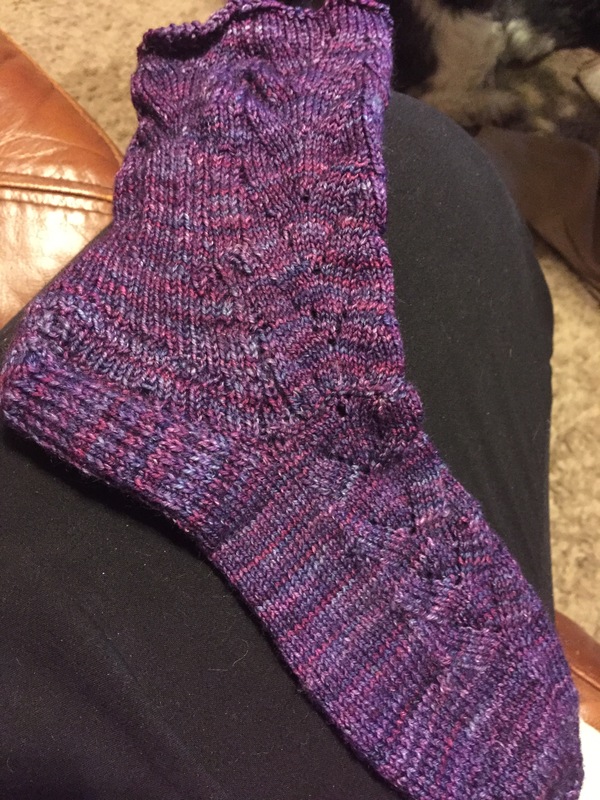 I have finally finished my Azurea Socks! In the picture on the left, that was the first sock in the pair. It was blocked in that picture. The picture on the right is both of the socks, one is blocked, the other one isn’t. Can you tell the huge difference that blocking this sock made? It opened up the lace pattern and made the yarn look better too. For the particulars: The pattern is called Azurea Socks. It is in the Interweave Knits Sockupied Fall 2013 issue. The sock pattern is for people who have wide feet and ankles because a lot of folks aren’t able to make socks that fit their wider feet and ankles. Let me just say that I love these socks! They fit my foot so well! Perfect length, perfect width, everything is so cool! I don’t know what kind of heel this pattern had in it. The designer didn’t say or give it a specific name. I just need to remember how it was done so that all the rest of my socks will fit me this well too! The yarn was MadelineTosh Twist Light in Flashdance colorway. It is a new yarn that MadTosh just released recently that has nylon in it for durability. I used size 2.25 mm needles which falls between US size 0 and US size 1 to get a gauge of 9 stitches per inch. I used magic loop, one sock at a time. My next sock adventure will be 2 at a time toe up socks. I found out that my foot is 10 inches long, that my foot circumference is 9 inches around so I need to make my sock 8 inches foot circumference so that they will fit snugly, that I needed to work from the toes up the foot for 6 inches before I start making the heel that equals out to about 4 inches long when it is all said and done. This gives me the perfect length for my socks. Previously, I was making the foot portion 7 inches long before the heel, and the heel was crawling up the back of my ankle towards my calf. That pair was so big! I am tempted to take those apart and re-do them so that they fit properly. I may just make another pair with the same type of yarn, only in a different colorway, which was the Lang Jawoll Atkion Yarn that I made my Southwestern Socks with. Those socks grow on my feet as I wear them, which means that I used a needle that was too large, and I made the foot portion too long, and that is why I have the problem with them moving around on my foot more than this pair. This new pair hasn’t budged since I put them on this morning! I just LOVE them! As this is the first patterned sock that I have done, I think that they turned out great. The other pairs that I have done were basic sock patterns that had no shaping. They just taught technique really. They showed me how to use DPNs vs. Magic Loop and top down vs. toe up. I think that I like the toe up best. Those seem to fit me better than the top down. I will have to make at least 1 pair of patterned top down to compare whether I like the top down or the toe up version better. I think I am gonna err on the side of toe up to be honest. I just like doing the toe up version. I hope that all the rest of my socks turn out this good, and I hope that I get better with sock making as time goes on. 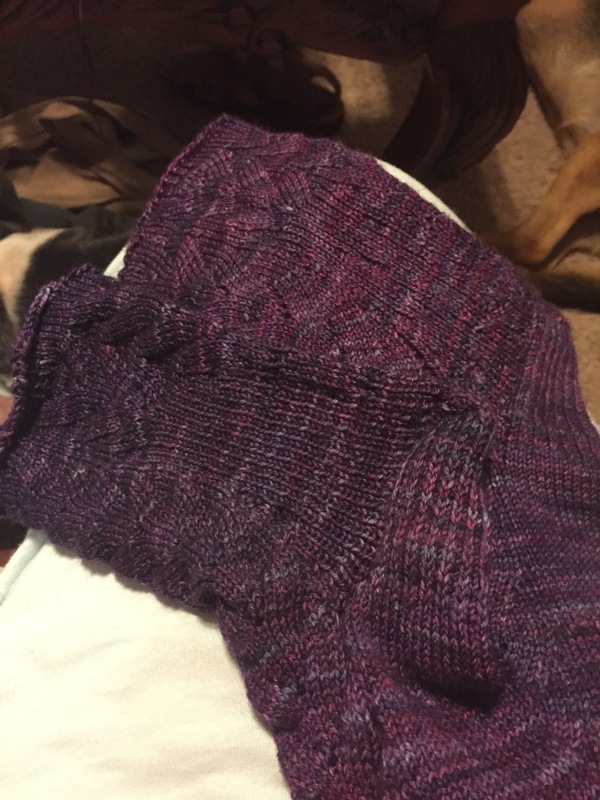 I have to learn to tackle the gusset and the short row heel with the wraps and turns. I tend to shy away from any pattern that has those items in it, meaning the short row heel with wraps and turns, because I have had trouble in the past doing short rows with the wraps and turns. I need to conquer my fear of that technique, don’t I? I want to be making at least 1 pair of socks a month until I get a whole drawer full of them! How many pairs will that take? How many pairs of socks do you make each year?